The Taliban claimed responsibility for the attack, which killed and injured dozens of people in Kabul, Afghanistan. Both attacks happened in heavily guarded parts of the city. Saturday's attacker made it through one security checkpoint by driving an ambulance and claiming to be taking a patient to a hospital, the Interior Ministry's deputy spokesperson Nasrat Rahimi told The Associated Press. The driver then detonated explosives at a second checkpoint near government buildings and embassies. The Taliban said the attack was aimed at the country's Interior Ministry. Andrew Quilty, a freelance photojournalist based in Kabul, was in a carpet shop a few hundred feet away when the blast occurred. Quilty told NPR's Scott Simon that the area is known as "Chicken Street," a bustling corridor crammed with merchants and shoppers. "I heard it, I came out from the store and I immediately saw people running," Quilty said. As he followed the smoke, Quilty saw broken windows, crushed cars aflame and then bodies. "In the immediate vicinity, I saw probably 12 to 15 all really just mangled, almost as if they were melted together, it was just a pile of bodies, most of them dead, some of them still alive," Quilty said. NPR's Diaa Hadid reports from Lahore, Pakistan, "a foreign aid worker described the aftermath as a 'massacre' as dozens were rushed to the hospital where he works." Condemnations of the attack and tributes to the victims poured forth on Saturday. "We condemn today's cowardly bombing in Kabul and those who perpetrated it," tweeted State Department spokesperson Heather Nauert. "Our thoughts are with the victims and their families, and we stand with the brave people of #Afghanistan." The mayor of Paris tweeted a photo of a darkened Eiffel Tour in "homage to the victims of the ignoble attack." "Parisians are on the side of the people of Afghanistan who once again are facing barbaric terrorism," Anne Hidalgo wrote. 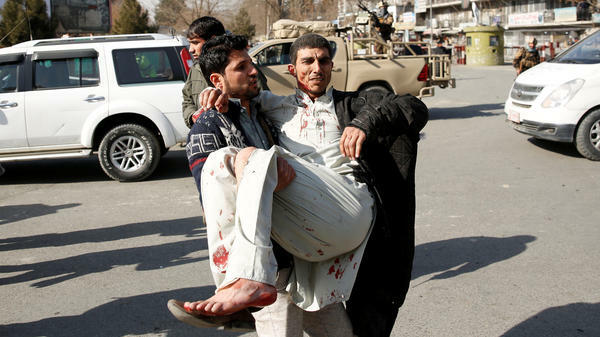 It's the latest in a series of large attacks in Kabul. An attack in December on a cultural center killed at least 41 people. And in May, a truck bomb in Kabul killed more than 150 people. Despite its heavy security, "Kabul is the most dangerous place in Afghanistan for civilians," Hadid says. Just over 90 miles to the east in Jalalabad, ISIS claimed responsibility for an attack on an office of Save the Children on Wednesday that killed at least three people.